Some people struggle with what they want to be when they grow up. Some may never realize, whether through hard work or good fortune, their dreams. Some perhaps never really grow up or want to grow up. This was not true for us – Bibiana and Jeff. Our lives and our life work have been blessed with knowing the “thing we were born for” – making wine. We make wine as individuals, we make wine as a couple, we make wine as a family. Blessings are multitude. We are born at a given moment, in a given place and, like vintage years of wine, we have the qualities of the year and of the season of which we are born. Each of us, not knowing of the other’s existence — one born in Columbia, one born in California — knew as teenagers that winemaking was for each our true calling. Without hesitation or question, we individually followed our hearts. Then our stars aligned and our paths crossed, beginning as colleagues working on separate projects within the same winery facility. Over time we comfortably became more than friends. Then like a blending of our vintages, we melded our lives; making wine, becoming a family and bringing to life our first child, Lucas. To work a vineyard, you need a lot of guts to do that. To go out there and work all year, you almost feel that these people talk to the grapes. Wine is a lifestyle, and you can talk about it for ages. It’s a passion . . . Growing grapes and making wine is not necessarily easy work. And it is work, after all. Certainly our calling has been romanticized and even criticized for its pervasiveness in “wine country.” Certainly it takes a great deal of time, energy, focus and resources. And most certainly it has and will continue to satisfy our particular personal and professional longings and dreams. 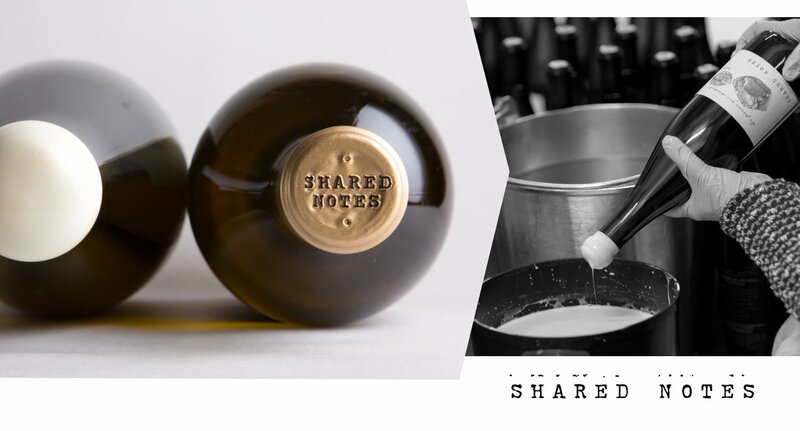 Shared Notes, our mutual winemaking venture, is our other child. As in our good marriage, friendship, and partnership, we always make room for one another’s opinion, experience and skill. We may not always agree. We may not always reach a conclusion about direction that truly satisfies us both, but we persist until the blended ideas become better and more understood than the “winning over” of one. All this is because we love what we do and what we have done and what will become. The opportunity to work through our blending decisions comes from a base of shared respect, learning and appreciation for both vineyards and wine. And underpinning all this is the desire to make classic wines expressing place. Our compatible individual strengths (and admittedly, some weaknesses) result finally in reaching mutually satisfying conclusions expressed as our Sauvignon Blanc vintages – Shared Notes. Now, we invite you to share with us our glowing golden bottles of Sauvignon Blanc, on summer days and balmy evenings around a table. There is food. There is conversation. There is joy. There is gratitude and appreciation. There are our loved ones, and this precious time. Enjoy.